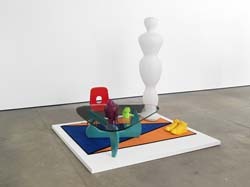 Matthew Darbyshire provocatively repackages the homogenisation of contemporary design: the moulded retro-future furnishings and CMYK colour schemes that dominate both public and private space. Democratised from minimalist couture chic to high-street decor to budget home-ware chintz, Darbyshire’s assembled objects try to define just what it is that makes candy-coloured plastic so modern, so appealing. 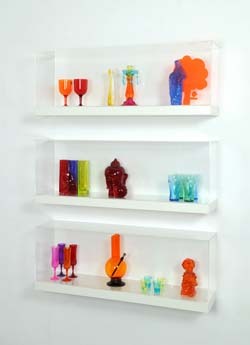 Replicating a domestic display, Untitled: Shelves No. 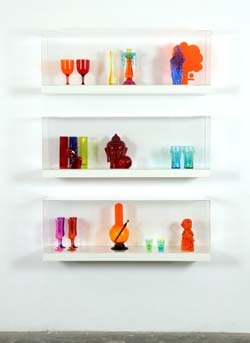 5 presents a collection of purchased goods: a Verner Panton miniature and a bong, religious icons and cocktail glasses, all fabricated in the same style, the numbing yet infinitely seductive hallmark of lifestyle aspiration. Darbyshire’s homey assemblages function as models of modern living, the kind of dioramic displays that might represent ‘today’ in design museums or shop windows. Their studied genericism and fetishistic staging doubles as a form of portraiture. Drawing inspiration from novelists such as JG Ballard and Bret Easton Ellis, Darbyshire conceives his sculptures in relation to shopping theory: we are what we buy, and use our belongings to project a desired image of ourselves. 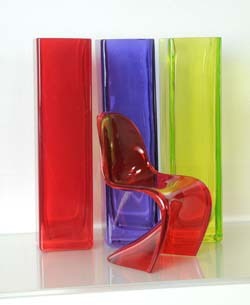 Furnished with well-known affordable brand name goods, Untitled: Furniture Island No. 2 invites speculation on the type of person who might have this as their living environment. 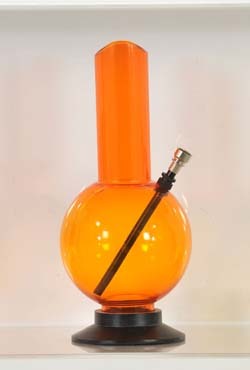 Its clinical hipness paints an ironic image of tragic yuppie-ness: chances are you probably own at least one of the items on display. Estate agents' brochures drop through the letter box, their design indistinguishable from that of lifestyle magazines. Newspaper supplements profile the homes of young stylists, gallerists and environmental activists, as though their choice of soft furnishings might provide hard news about their psyches. MTV Cribs shows us around 50 Cent's Connecticut ranch house ('I ain't gonna tell you no lies, these chairs came from Mike Tyson'). Interior designer Laurence Llewelyn-Bowen launches a collection of tableware on his website with the words: 'I've always had a theory that the way we display specific objects in the dining-room is unwittingly or at least subconsciously inspired by Roman altars to the household gods'. Curated by Anna Colin, Matthew Darbyshire's exhibition 'Blades House' at Gasworks (the title is taken from the name of a nearby social housing development, parts of which are now privately owned) began with a human figure, or rather its absence. Suspended from the ceiling of a silver-wallpapered antechamber was a man's suit, its fabric patterned with the logos of various luxury and budget brands, from Ralph Lauren to George at Asda. These empty vestments suggested an invisible man, consumed by consumerism. Who is he? How might we know him? The answer's simple - step inside his beautiful home. Beyond the dangling suit lay a door which opened onto a mock-up of the interior of a white-walled, windowless and almost oppressively neat one-bedroom apartment, based on the floor plan of a unit in the exhibition's titular block, and belonging, in Darbyshire's words, to 'a fictitious, urban middle-class professional in his mid-30s'. Padding across the entrance hall's orange carpets, the visitor was greeted by a Brompton folding bicycle (also orange), framed prints by Patrick Caulfield, Michael Craig-Martin and Henri Matisse, and a hatstand on which was hung a hooded top that seemed snatched from the wardrobe of some Nu-Rave kid from the television youth drama Skins (2007-ongoing). 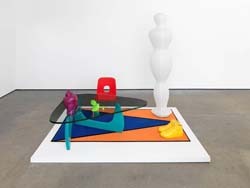 This penchant for mixing bright colours with bold shapes (Darbyshire is quietly masterful in his corralling of tone and form) was repeated in the bedroom, where the click-wheel of a tangerine iPod Nano was echoed in a CND logo painted in a rainbow of muddy, Morris Louis-like washes onto the surface of a bedside lamp. Period details proliferated - a Muji bed, a Paul Smith striped shirt, a Robin Day E-Series chair of recent manufacture - and the room might easily have featured in a magazine piece on the contemporary bachelor pad ('combine classic Modernism with a witty Pop sensibility and the acid palette of the Third Summer of Love') or functioned as a museum display depicting a 'noughties' interior that, characteristically, hasn't quite shrugged off the 1990s, or that decade's preoccupation with retro chic. Darbyshire gives the ICA's public spaces the coloured lighting schemes of other public, retail and corporate spaces from across London. Matthew Darbyshire (born Cambridge, 1977, lives in London) lives in a bubble of deep turquoises, fuchsia pinks and acid yellows - he sees these colours everywhere and so, he points out, do you. Darbyshire is interested in the non-specificity of today's design language: the fact that bright CMYK dots are the logo for an estate agent and a cinema, as well as a NHS walk-in centre; that Arne Jacobsen egg chairs can be found in London's Zetter boutique hotel as well as in recently rebranded McDonald's restaurants. For Nought to Sixty his work is not in the ICA gallery spaces but in the publicly available, non-art spaces that are open to being branded, advertised in or hired for functions; as his ICA project these spaces are given the coloured lighting schemes of other public, retail and corporate spaces from across London. The ICA's windows looking out onto the Mall are illuminated to mimic the yellow lighting of the façade of Selfridges (a department store that has itself used the feminist artist Barbara Kruger's trademark black, white and red posters for its advertising campaign; co-opting work that was originally critical of consumerism). A magenta light strip on the ceiling over the ICA ticketing area alludes to the lighting in the entrance to the Hackney Community College - a far cry from Selfridges, but an organisation that has chosen to express its identity in the same visual vocabulary. A green cast on the desk of the box office evokes the green in the lobby of British Petroleum headquarters. One of the most interesting issues raised by Darbyshire's practice is the polymorphous role of the art institution. Whilst Selfridges, Hackney Community College and BP have little in common, one can imagine links between the ICA and each of these, whether in terms of leisure activity, audience, education programmes or sponsorship. Perhaps most importantly, the ICA is able to utilise the design language of CYMK non-specificity while also to critique its ubiquitous presence.